SMTP Settings is an advanced feature of OpKey which enables you to send your execution result to someone by applying SMTP Settings. 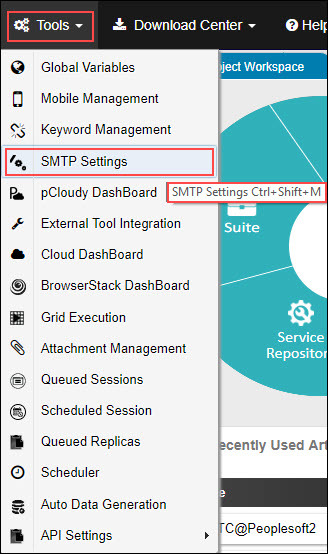 To apply SMTP Settings, click SMTP Settings under Tools menu. SMTP Settings page opens. Fill all required fields and then save it. You can send a Test Mail to the added email id. In case, you have not configured SMTP Settings from Tools menu then you can apply SMTP Settings also from Execution Wizard. 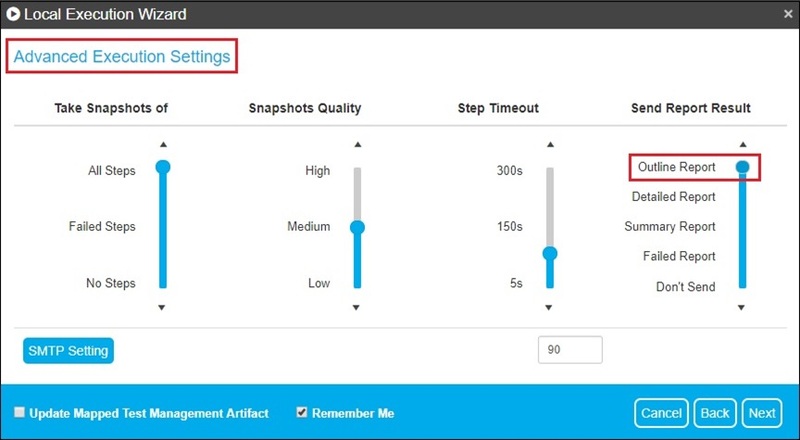 Make sure that you have checked Show Advanced Settings option to show Advanced Execution Settings page having SMTP Settings. Check Show Advanced Settings checkbox and click Next. Click on SMTP Settings to apply it. In OpKey Web, Multilingual websites can be tested by using SetOR keyword for which the OR needs to be shared. 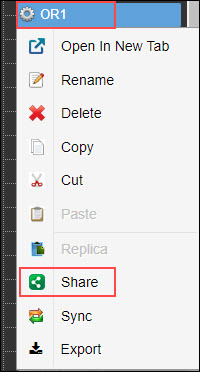 To share an OR file, right click on OR file in Project Workspace and click Share option. Now, the user can add comments between the Test Steps in Test Case/Function Library file. It is helpful in categorizing Test Steps as per requirement. There will be no effect on the execution of the added comments. Execution Report contains crucial information about the test execution session. 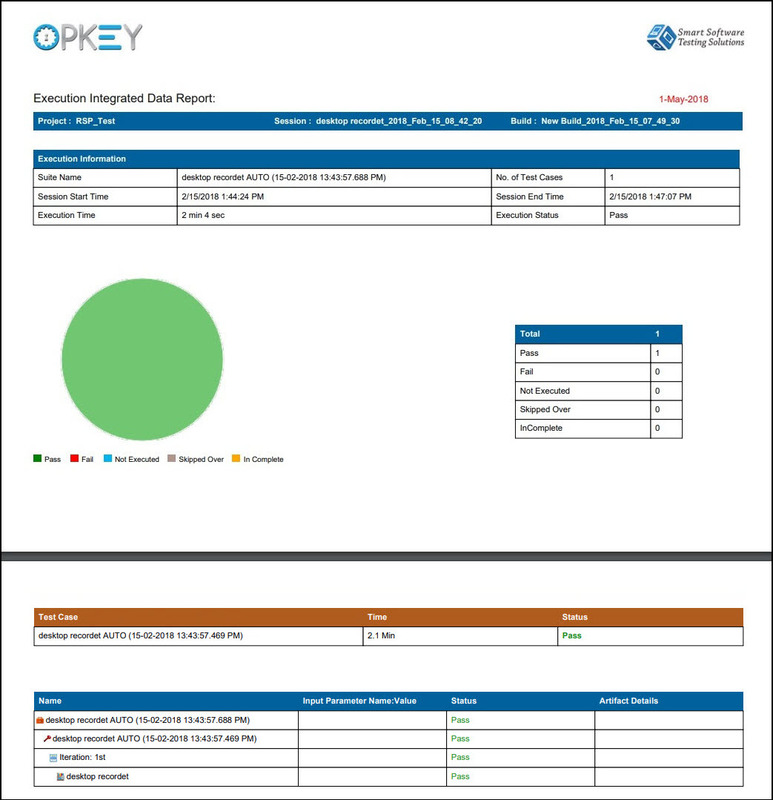 There are two types of Execution Result Reports in OpKey Web – Summary Report & Detailed Report. The Summary Report displays the name of the Test Case(s) with their status i.e whether the Test Case is Pass or Fail in the Execution. However, the Detailed Report displays information like the name of the Test Case(s), their Test Step(s) along with their status (Pass or Fail during Execution). Click on Export Report button to do so. Enter Report Name, select Report Type (Summary or Detailed) and Format (PDF or Excel). You can export Execution Summary & Detailed Report in PDF & Excel format by clicking on Export Report button. You can view the execution result of Detailed report along with the snapshots for all the Test scripts. 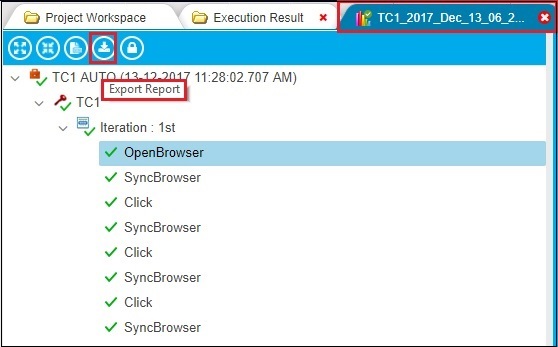 If the execution result has the snapshots then the exported detailed report will have a column for Snapshots, where a link for snapshot is displayed, clicking on Snapshot link will open the snapshot. Navigate to the Execution Result view & select a Session. Fill all required fields and select Detailed report. 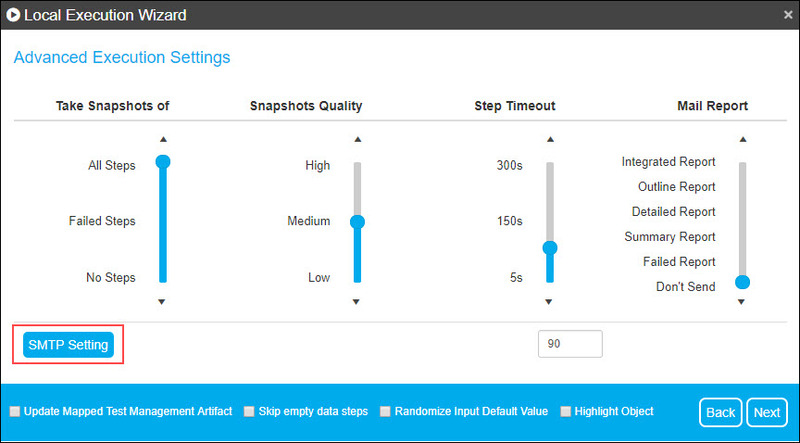 Check With Snapshots checkbox (if you want report with snapshot). 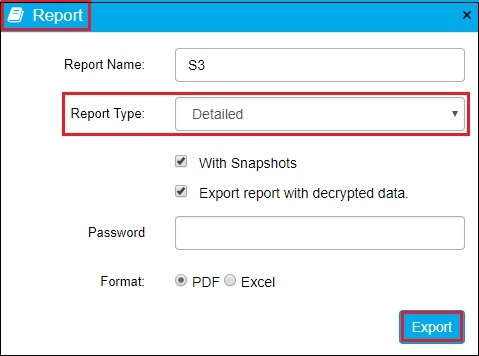 Check Export report with decrypted data checkbox (if you want to decrypt report data). Enter encryption password set at the project level to decrypt the report data. A popup window will get open as follows. 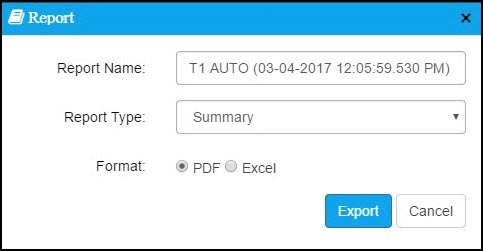 Enter Report Name and select Report Type to be exported in PDF format. Click Export. The execution report gets downloaded into the Download folder of your machine. If the selected Report Type is Summary, the following report will be displayed. 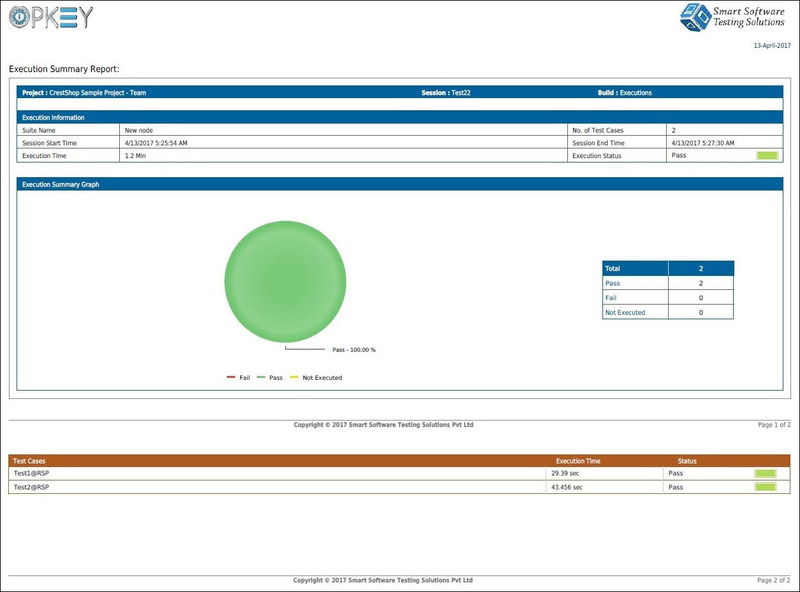 If the selected Report Type is Detailed, the following report will be displayed. This Report includes detailed information about the Execution Result. Now, user can export his/her execution report also in Excel format. Once execution has completed successfully, go to the execution result session and follow below given instructions to export report in Excel format. Click on Export Report button, a popup window will get open. Enter Report Name and select Report Type to be exported in Excel format. 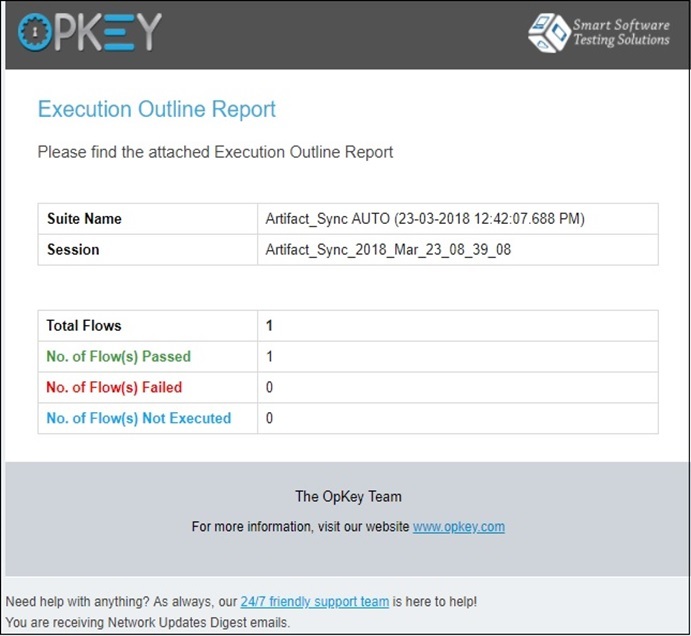 OpKey Web users can now send Outline report to the configured Email Id (under SMTP Settings). It is high level report which contains few crucial information about the executed test script. Make sure that you have configured SMTP Settings successfully. Click on Run Now to execute your Test Case. Check Show Advanced Settings checkbox and click on Next. Drag scrollbar to the desired Report Result under Send Report Result settings. 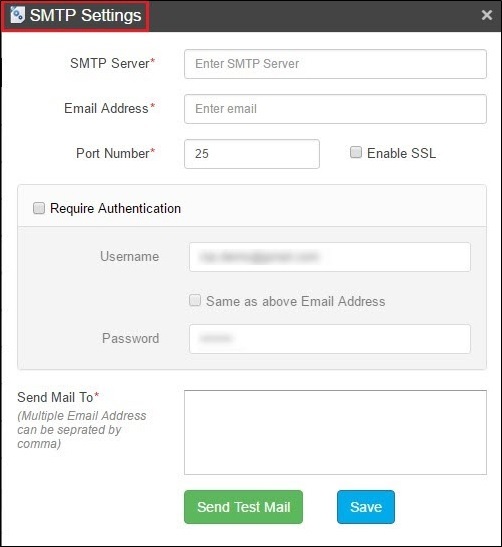 If you have not configured SMTP Settings yet then click on SMTP Settings option and configure it. Email received for the Outline Report. It contains few brief information about the executed test like Suite Name, session, Total Flows, No. of Flows(s) Passed, No. of Flows(s) Failed & No. of Flows(s) Not Executed. There is a PDF file of Outline Report attached with the mail. This Outline Report of test execution includes Suite Name, No. 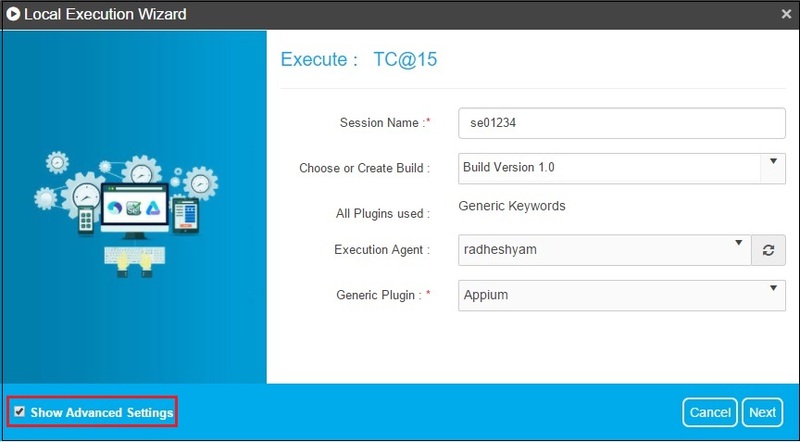 of Test Cases, Session Start Time, Session End Time, Execution Time, Execution Status under Execution Information section. It also contains execution outline graph and Keyword Pass/Fail information under Iteration section. 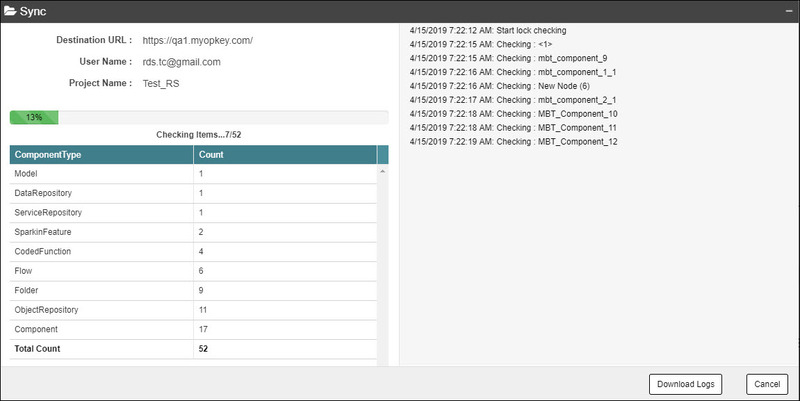 Now, OpKey Web users can export Integrated Data Report for Test Execution of a Suite or Test Case having added Function Libraries. Integrated Report specifically contains information about the input parameters added to the Function Library. There will be the detailed information about the input parameters along with their values. If there is an input parameter with default value in FL and mapped with the Test Case then Integrated Report will contain the input parameter with its value. If there is an input parameter with default value in FL but that input parameters is not mapped with any test Step in FL and you have mapped this FL with the Test Case then Integrated Report will contain the input parameter name with no value. If there is an input parameter added to FL and its value are given from TC/FL then the Integrated Report will contain the input parameter with its value. Open your Test Execution session from Execution Result. Click on Export Report button. 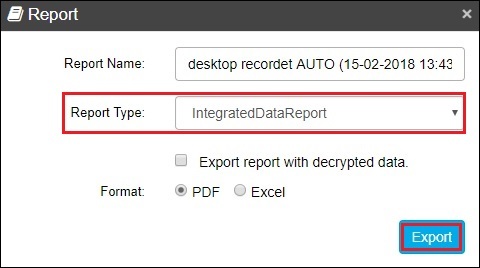 Select IntegratedDataReport from the Report Type dropdown. 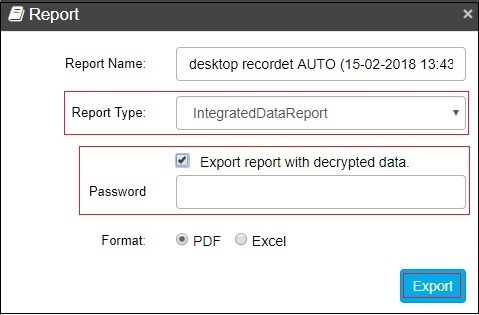 You can check Export report with decrypted data checkbox to export data in decrypted format. To do so, check this checkbox and enter Password. 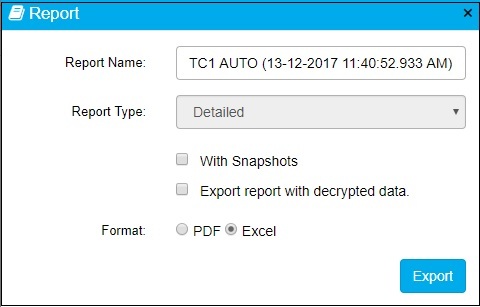 Select Report format as PDF and click on Export. Gherkin Report is one of the most awaited feature of OpKey which is now available in this OpKey release. You can now export your Gherkin report of the execution having Gherkin & Sparkin artifacts. On export report wizard, only Gherkin & Sparkin files (added in Suite) will be visible from which you can select the desired files from them. Here, you can view that there are 2 Gherkin and one Test Case file added to a Suite. Suite has executed successfully and now let us export Gherkin Report. Enter Report Name, select GherkinReport from Report Type dropdown. You can check Include “Skipped Over” steps checkbox, if you want to include skipped test steps. PDF Format is selected by default. Click on Export. 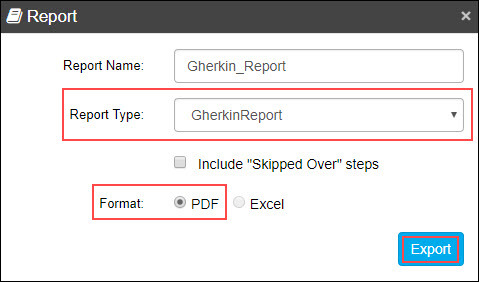 Gherkin Report filter wizard opens which has a filter with few fields like Name, Custom Keyword, Review and Approved By, Show Remarks, Select to add Template etc. 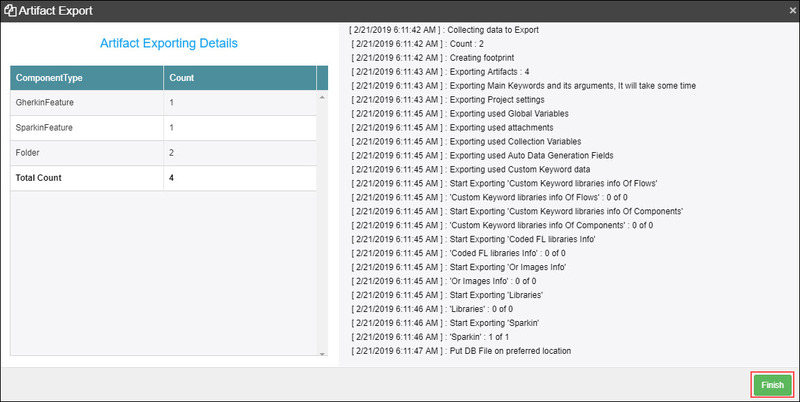 List of all the Gherkin & Sparkin artifact(s) are displayed in the Gherkin Report export wizard; you can select desired Gherkin & Sparkin artifacts and export Gherkin report. Select to add Template option allows you to add a template page on the last page of the exported Gherkin Report file which contains some important information about the execution like Test Environment, Windows Edition, Database Version, System Type etc. Here, you can have a look at the exported Gherkin Report. Now, OpKey Web users can decrypt their Execution Result by using Decrypt Result button. The encrypted information of execution result will be decrypted in readable format. Open your execution result and click on Decrypt Result button. Enter Decryption Password and click on OK. The encrypted execution result information has been decrypted into readable format. “OpkeyIsBest” is the default Data Encryption Password. 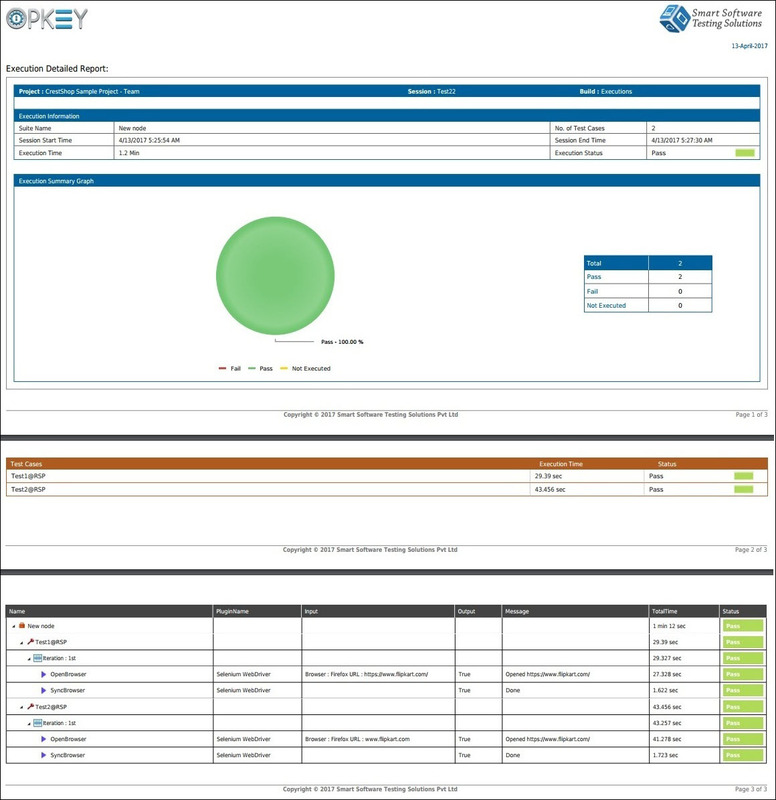 Execution Result Dashboard is the main page of Execution Result which shows a graphical representation of test executions having a different status. 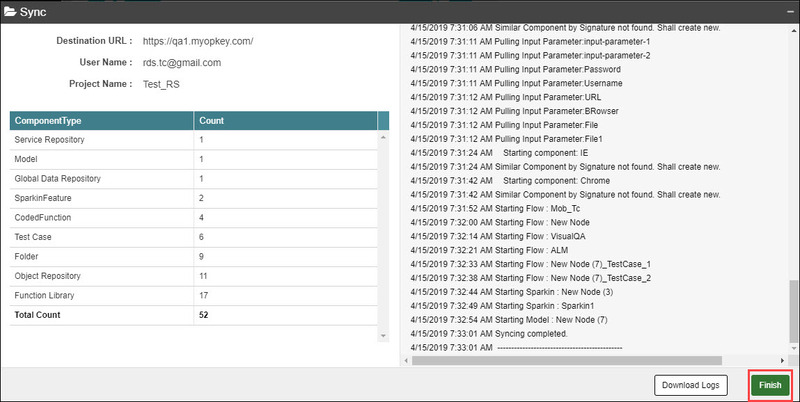 This page contains a Test Execution Analytics section which shows completed Test execution sessions (Passed, Failed, InComplete, NotExecuted, & Total). You can view mapped artifacts associated with the selected session. Right click on the desired session and click Open in New Tab. Open in New Tab feature allows you to open selected folder/artifact in a new tab. 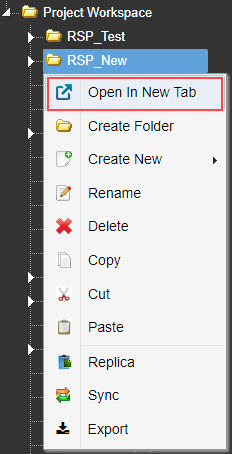 Select desired folder/artifact, right on it and select Open in New Tab option. The desired folder/artifact will get open in a new tab. 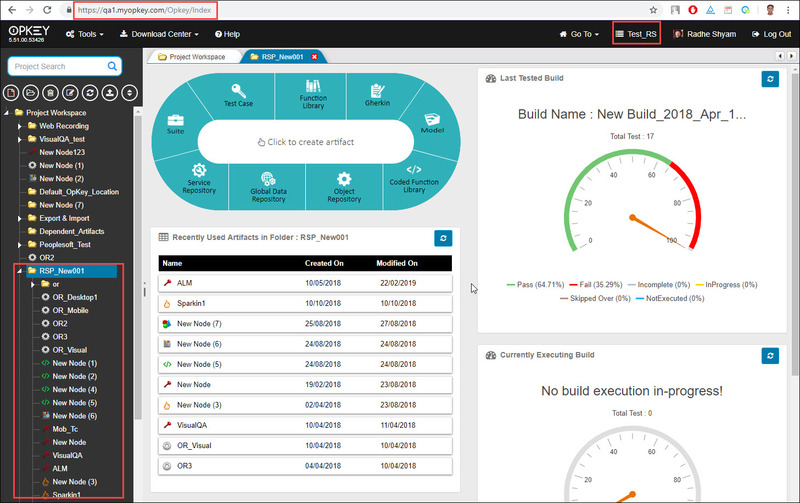 Project Workspace Dashboard is the Home Page which shows a graphical representation of Project Workspace and Test Executions. This page contains Recently used artifacts in folder: Project Workspace section which includes recently used artifacts of Project Workspace. You can right click on the desired artifact and click Open in New Tab. 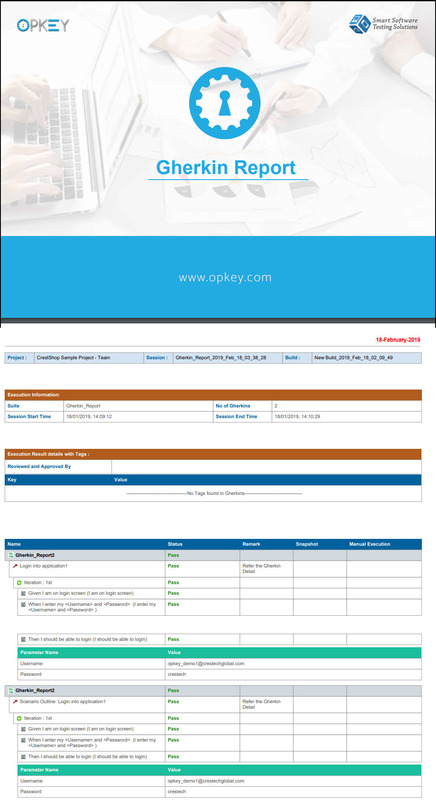 This feature allows you to upload the documents within OpKey. These documents could be of any type like excel, word, image, pdf, etc. but it should not be an executable file. You can use your uploaded document in your Test Script as per your requirement. The uploaded file(s) get saved under the DB, if the File Store Management under the agent utility is chosen as Store in Database otherwise it get stored under the Shared File Storage. Click on ‘Attachment Management‘ link under Tools menu. Attachment Manager window opens. Browse & select your file to be uploaded. 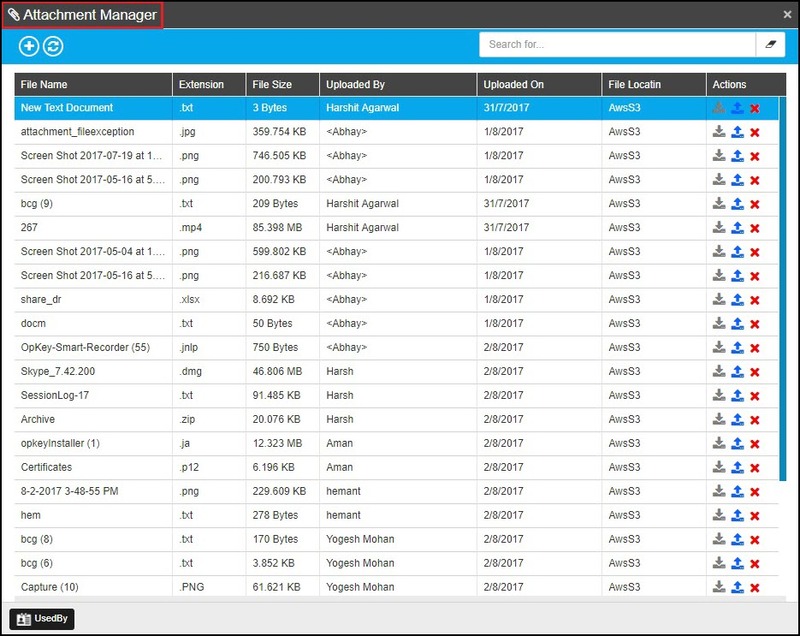 The added file(s) can be deleted, updated, exported or searched by using corresponding buttons on Attachment Manager window. Data input parameters has been changed in the above keywords. A new Data Type File has been added. 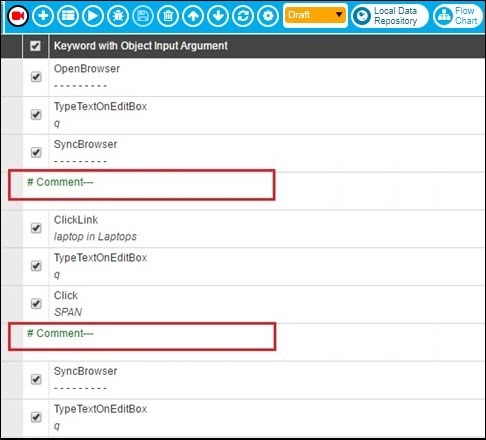 A new tab of Data Input Arguments has been added with the name of Attachment. While adding an input parameter under Function Library. While creating a custom keyword. Files with size upto 4 MB can be uploaded in DB. For uploading files more than 4 MB size, user will have to change the “File Store Management” to store in Shared File Storage under the Admin utility. In this practical scenario, let us get file name of an attached image file by using GetFileName keyword. First of all, upload that required image file on the storage location as described above. Go to Tools Menu > Attachment > Upload your file. Execute this Test Case by clicking on Run Now button. Once your execution process gets completed, you can see the execution result and analyse it. In the result, in Output column you get file name of attached image file by using ‘GetFileName‘ keyword. In the same way you can use the other keywords related to file attachment feature. 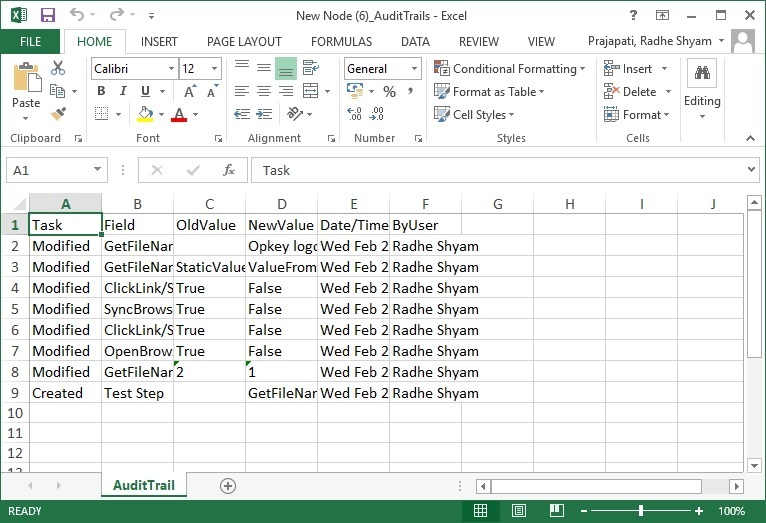 Now, OpKey Web users will be able to export AuditTrails of the artifact to the Excel file. 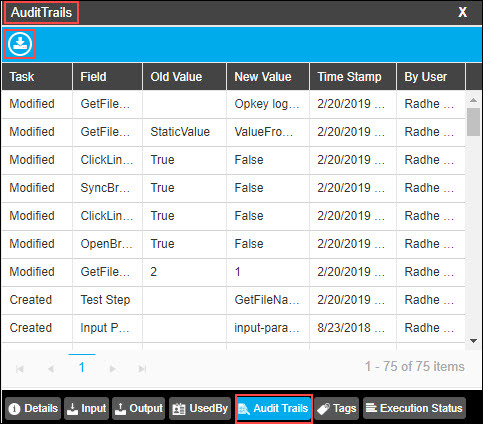 To do so, navigate to the dockable panel of the artifact, click on AuditTrails tab and then click on Export Audit Trails. A new window of Export to Excel opens from where you can provide Report Name, select a Date Range of maximum 90 days and click on Export. 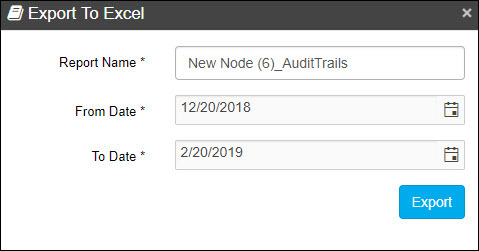 You can view your exported Audit Trails Excel file. Now, view the exported audit trails in excel form. Now, OpKey user can remove the mapping of the associated object from the test step. 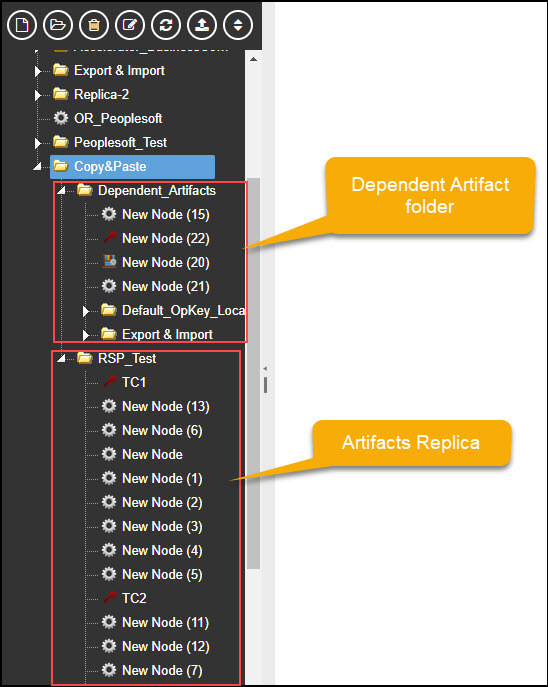 To do so, you just need to select the desired test step having associated object and click on the Remove Mapping button under the Object Repository tab. 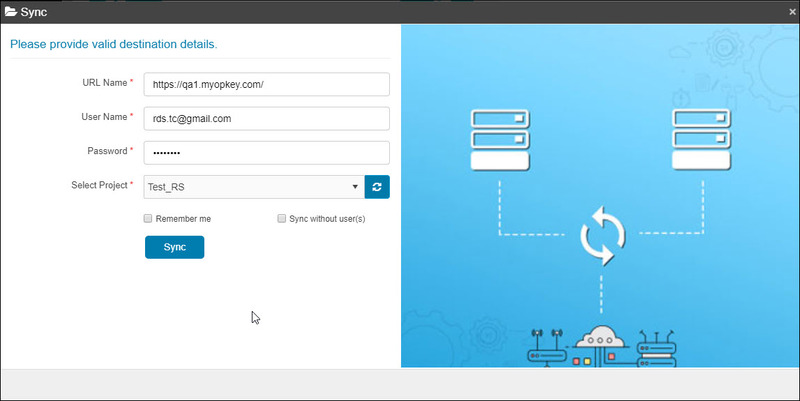 This is one of the most awaited feature of OpKey Web. 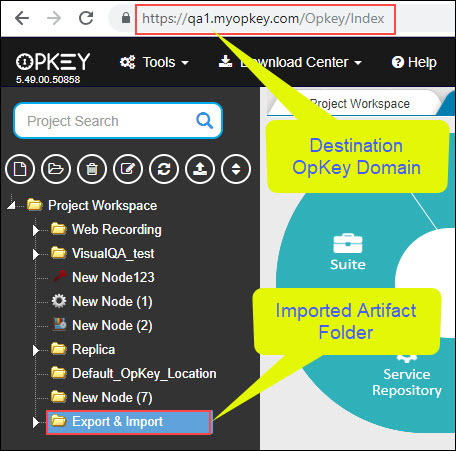 Now, OpKey users can export existing artifacts from one OpKey domain and import the exported artifact(s) to another OpKey web domain. By using this feature, you can share desired artifact(s) to someone on OpKey Web working on different OpKey web domain. Right click on the selected artifact folder and click on Export. Have a look at the Artifact Exporting Details. Artifact exporting process is going on. Here, you can have a look at your exported artifact. This exported artifact is portable and you can import it at any other (destination) OpKey Web environment. Let us see how to import the exported artifact folder. 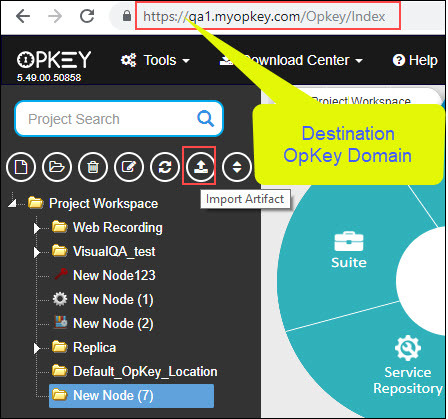 Go to the destination OpKey Web domain, navigate to Project Workspace tab & click on Import Artifact button. Import/Replica wizard opens. Select Import option and click on OK.
Browse & select the exported artifact compressed folder and click on Open. Artifact Import wizard opens. Just within few moments your artifact(s) get imported to the destination OpKey domain. 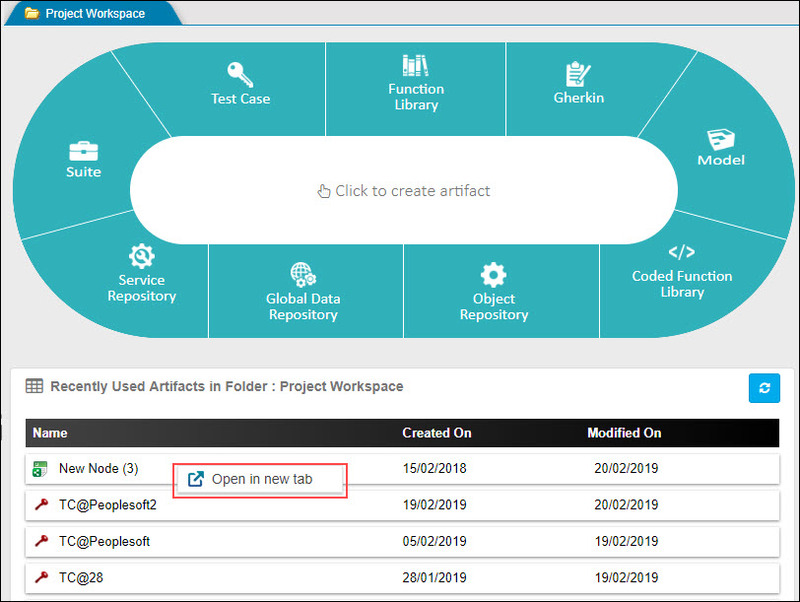 Click on Refresh button in Project Workspace to view the imported artifacts. 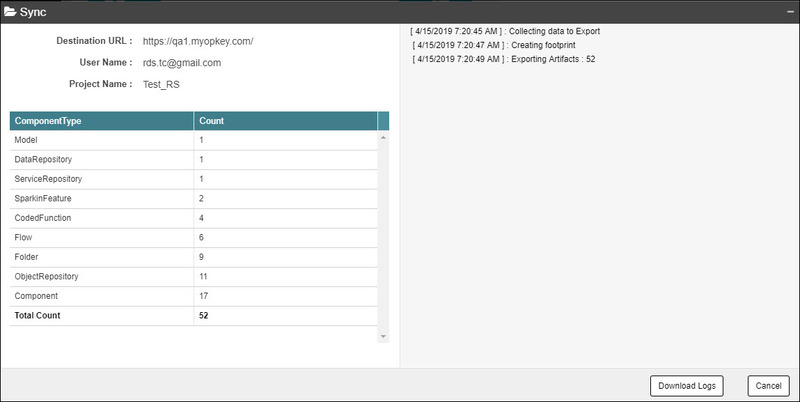 Here, you can view that the desired artifacts have been imported to the destination OpKey domain. Note: You can not import exported artifact(s) on the same domain so far i.e. source and destination domain of OpKey must be different. OpKey allows its users make replica of the required artifact(s) in same or different OpKey domain, as required. There are two ways to make replica of the artifact: Copy/Paste and Import/Replica but both ways are fundamentally same. 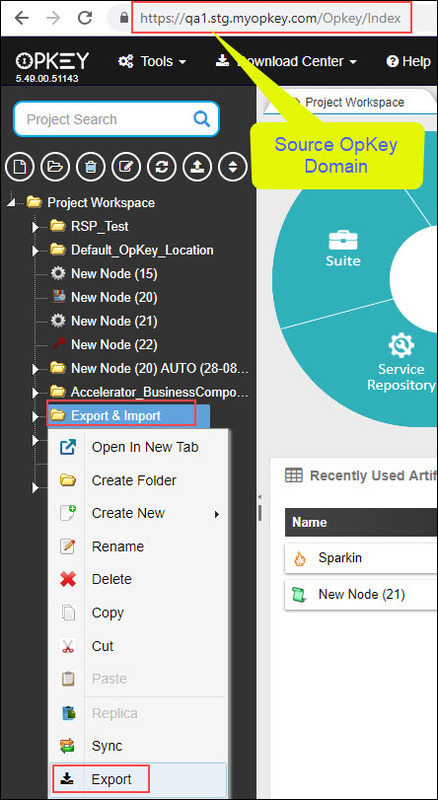 You can make replica of the exported artifact as well as make replica of the copied artifact.If you have exported artifact in compressed form then go to the Import Artifact button at Project Workspace in the destination OpKey domain (same or different). Import/Replica wizard opens. Select Replica option and click on OK.
From here, you can choose or create a folder in which you want to make artifact replica. 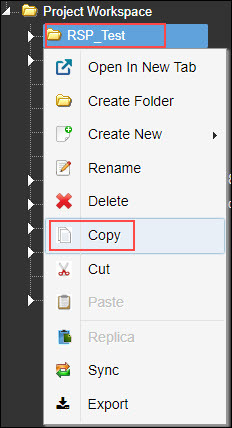 You can copy any desired artifact or folder and then make its replica in the desired folder. Select the desired (destination) folder, right click on it and then choose Replica option. If you want to add tags then you can add them from here. 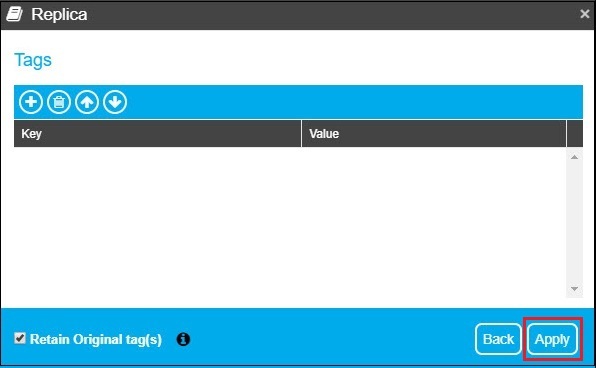 Click on Add Tags button, add tag keys and values. You can retain original tags of the artifacts by checking Retain Original tag(s) checkbox. Process of making replica has now completed successfully. You can view complete logs here. Replica of the desired artifact(s) has been created successfully. Here, you can view the entire artifacts. When you make replica of copied test case which is mapped with any other artifact (like OR, DR, FL etc.) 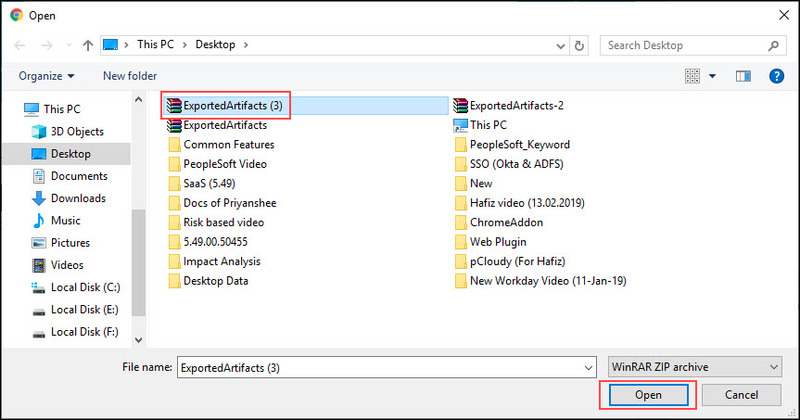 file then all the associated artifacts are also copied and pasted at desired location in the auto-created folder named as Dependent_Artifacts. Thus, this replica test case will be independent test case file and there will be no relation between this test case file and the earlier mapped artifacts. You can copy child & parent node but you can paste or make replica of copied parent/child node only within a parent node. In case of making duplicate (Copy & Paste) artifacts, when you copy a test case file which is mapped with any other artifact (FL, OR, DR etc.) file then you are able to paste that test case file at desired location and it will remain mapped with the earlier mapped artifact file. There is a notification message with checkbox that “Folder containing Gherkin/Sparkin file will not be replicated with any data. Only blank Gherkin/Sparkin file will be created at the destination end.” You can uncheck this checkbox, if required. 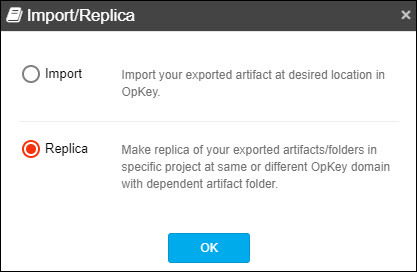 OpKey users can now sync their files and folder from one project to another project in the same or different OpKey domain. In this way, all your file(s) and folder(s) will get exported and synced with the desired project existing on the targeted OpKey domain. Let us see how to sync a folder (containing few files) from a project to another project existing on the same domain. 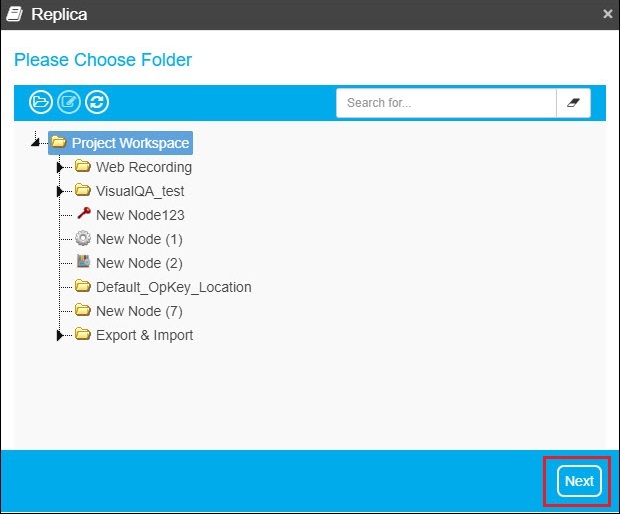 Navigate to the Project Workspace, right click on the folder and the click on Sync option. Enter OpKey URL Name (domain name), User Name, Password, select Project and click on Sync in sync wizard. You can save the entered credentials in Sync Wizard by marking Remember Me checkbox. If you want to sync file or folder without syncing user(s) then you can mark Sync without user(s) checkbox. Sync process gets started. Here, you can view the destination url, user name, project name, files with count and sync logs. Sync process is going on. Please wait until the sync process gets completed. In this step, it checks if the syncing file(s) & folder(s) are existing. Enter Data Encryption password of the Source Project and click on Submit to proceed sync process. Here, you can view that the sync process has completed. Click on Finish. Here, you can have a look at the synced folder is now existing in another project on the same OpKey domain. Thus, the sync process has now completed successfully.